For many decades national parks have been seen as the vital safe place for conserving wildlife through protection of wildlife habitat. Indeed national parks and other types of conservation reserves provide important core areas to protect native plants and animals. However, research in Australia and overseas has shown that parks alone, even large parks, cannot by themselves protect all native plants and animals. Many wildlife species move over huge areas, and need different habitats at different times of the year to provide food and shelter. Some ecosystems and the species that live in them only occur in areas which just happen to be favoured for development by people. Examples of these are fertile valleys used for agriculture, and coastal areas developed for resorts and residential building. Ecosystems in these places have mostly been cleared and the remnants are often on privately owned lands, not available for publicly owned parks. Research over the last decade has shown the importance of maintaining ‘connectivity’ in nature to ensure all species can survive and thrive. Maintaining the natural connections between different areas allows species to move through landscapes, ensuring they can feed, find shelter and successfully breed. The degree of movement will vary greatly for different species. The Wompoo Fruit-dove lives year round in the forests of the Hinterland and eats rainforest fruits. Different trees fruit in different localities and in different seasons. The Wompoos move to many sites throughout the year to find ripe fruit. However, because of the risk of predators and their need for frequent snacks, they tend to avoid flying over cleared paddocks. This means that they never reach some forest blocks isolated by past clearing. This contrasts with some small mammals like the Red-legged Pademelon, a small wallaby of the rainforests. Pademelons probably stay in the same forest patch for all their adult lives, but their young need to disperse to new territories when they mature. The more corridors and connections in the landscape the more likely the young will survive to set up new homes. These movements and connections are important not only for the animals involved. Many are ‘keystone’ species, which keep the forests healthy. A well established example in the Hinterland is that all the fruit-doves are vital in spreading the seeds of the rainforest fruits they eat. The seeds pass unharmed through the fruit-dove gut and are deposited (often in a neat pile of pigeon manure) on the forest floor, ready to germinate. If fruit-doves avoid an isolated bush block because of surrounding clearing, then that bush will be cut off from receiving seeds only eaten by fruit-doves, and the plant diversity will decline. This is just one example of the myriad connections between different species which maintain the healthy ecosystems we value. The new ecological research on connectivity demonstrates the vital importance of maintaining a high level of natural bushland in a landscape, and the connection of bush blocks wherever possible. This will maximize the abundance of populations and increase species diversity. In some parts of the Sunshine Coast Hinterland we are fortunate to have relatively intact ecosystems. Many of the remaining larger blocks of bushland are now protected in National Parks. Exceptional efforts by private landholders have increased the amount of bushland in some districts in recent years. This has all contributed to making the ecosystems of the Hinterland more robust and resilient to pressures such as climate change and invasion by noxious weeds. However, in many other Hinterland localities, bushland has been fragmented and is now in smaller and more isolated blocks. For some wildlife species this means that the total amount of available habitat that they can use for feeding and breeding, is restricted and inadequate. Much of the remaining bushland is on private land so the support of local residents is key. Hinterland Bush Links works on the simple principle that we need to protect and connect what bushland is left, in order to restore the greater connectivity of the landscape. On bigger blocks of land this may mean a broad bushland corridor is restored, with support from government agencies. In the towns it can mean making a garden ‘wildlife friendly’ by planting local trees. All residents of the Hinterland can assist. 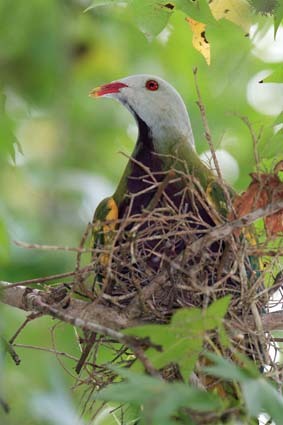 A native fig in a backyard in Maleny may only be visited once a year by Wompoo Fruit-doves when the tree fruits. But that might get these birds through a time of food scarcity so that they can breed and bring another generation into our world. © Photo by Raoul Slater, "Wompoo Fruit-dove"